SINGAPORE -Resident professionals, managers, executives and technicians (PMETs) found themselves in a better position in 2017, with lower unemployment and long-term unemployment rates than 2016. Median incomes also rose faster this year, after taking inflation into account, another sign of improved economic conditions and demand for higher-skilled manpower, said the Ministry of Manpower (MOM) in a report released on Thursday (Nov 30). The report is based on the ministry's Comprehensive Labour Force Survey conducted in the middle of this year of Singaporeans and permanent residents. For PMETs, the unemployment rate fell slightly to 3 per cent this year, down from 3.1 per cent last year, after trending upwards since 2012. But the rate is still higher than the first half of the decade. The long-term unemployment rate, which measures the proportion of the labour force out of work for at least six months, also improved to 0.7 per cent this year, down from 0.9 per cent last year. PMETs now make up 56 per cent of working Singapore residents. The group was the worst hit during the slowdown in the last few years, said DBS economist Irvin Seah, who expects further improvement in their job prospects as externally-facing sectors such as information technology and financial services recover. Mr Toby Fowlston, managing director for South-east Asia at recruitment firm Robert Walters, also said that e-commerce, insurance and logistics are among the key sectors driving the growing demand for high skilled workers. However, non-PMETs faced a harder slog as there is a shrinking number of non-PMET job vacancies, a trend since 2014, said MOM. The unemployment rate for this group rose to 4.5 per cent this year, from 4.2 per cent last year, while the long-term unemployment rate remained unchanged at 0.7 per cent. Still, the average worker earned more this year - median monthly income for residents in full-time jobs, including employer contributions to the Central Provident Fund, rose by 4.3 per cent to $4,232 this year. This was a higher pay rise than the 2.7 per cent growth last year. Taking preliminary inflation figures into account, the real median monthly income rose by 3.7 per cent this year, up from 3.3 per cent last year. In a Facebook post, labour MP Patrick Tay called on employers to “continue to raise productivity by embracing technology and innovation and share the gains from productivity with workers to motivate them”. Maybank Kim Eng economist Chua Hak Bin said, however, that unlike the surprisingly strong wage growth for full-time workers, the report shows that the median income for part-time workers remained flat from last year to this year. “If the proportion in freelance and part-time jobs are growing, keeping track of wage trends in this part of the economy will become more important,” he said. MOM noted that firms will have to continue to transform and become more productive in order to sustain this growth. Lower-wage workers have seen their gross monthly incomes rise too, at a faster pace than at the median, boosted by initiatives like the progressive wage model which sets wage floors for various skill levels. Over the past five years, income at the 20th percentile for residents in full-time jobs rose by an average of 4.8 per cent per year, to $2,200 in 2017. This is higher than the average growth of 4 per cent per year at the median. Meanwhile, the ageing population and higher likelihood for young people to pursue further education instead of starting work has brought the labour force participation rate down slightly for residents aged 15 and over, said MOM. It was 67.7 per cent in June this year, down from 68 per cent a year earlier and a peak of 68.3 per cent in 2015. The rate measures the proportion of the population that is employed or looking for work. 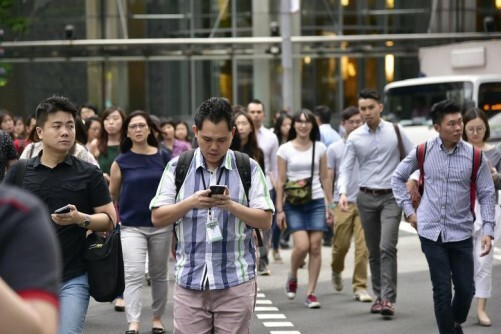 In its report, MOM noted that Singapore's labour force participation rate is already one of the highest compared with countries in the Organisation for Economic Cooperation and Development. These include the United States and many developed European countries. It added that to keep up and further strengthen this rate, "we will need to press on with efforts to allow older workers to remain in employment longer, and make available more flexible work arrangements, especially for those with caregiving responsibilities". The employment rate for residents aged 25 to 64 rose to 80.7 per cent in June 2017, up from 80.3 per cent last year. For those 65 and over, it rose to 25.8 per cent, up from 25.5 per cent. But more part-time workers actually wanted to work longer hours. The time-related underemployment rate rose this year to 3 per cent of employed residents. It had declined steadily from 4.6 per cent in 2011 to 2.7 per cent last year. Search for PMET job opportunities on STJobs.sg here.